From small, rural health organizations to large, urban IDNs with patient populations in the millions, MEDITECH customers are leading the new age of healthcare. Meet four customers who are among the most innovative in healthcare and learn how they're extending their legacy of innovation with MEDITECH’s EHR. One of the largest care networks in the Midwest, Avera Health leverages MEDITECH’s EHR across acute, ambulatory, and home care settings spanning five states. With 330 locations in 100 communities, Avera solved their geographical challenges by developing one of the most advanced telemedicine programs in the country and implementing MEDITECH’s Web EHR, which is designed for mobility and efficiency. After re-engineering the patient experience through automation and patient-facing technology (including MEDITECH’s patient portal), Humber River Hospital was recognized as the first fully digital hospital in North America, setting the standard for healthcare organizations around the world and encouraging others to be bolder in adoption and focus on patient care/safety. 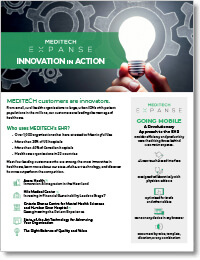 Download our full Innovation In Action Whitepaper to learn more about our state-of-the-art technology, and discover how MEDITECH makes the power of health IT accessible to a wider range of healthcare organizations than any other vendor.